The Olde English Sheepdog's origin can be traced to the early 19th century and was originally bred in west England. Devon, Somerset, and Duchy of Cornwall are believed to have been the first counties for the breed to appear in. The breed it originated from is unclear, though some say Scotch Bearded Collie and the Russian Owtchar. 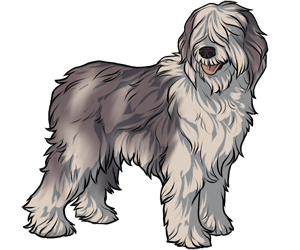 The Old English Sheepdog Club of American was started in 1904 and the breed was officialy recognized by the AKC in 1905. -The gait of the Old English Sheepdog is much like that of a bear's shuffle.